The experiments covered by my recent articles about filesystems and L4Re managed to lead me along another path in the past few weeks. I had defined a mechanism for providing access to files in a filesystem via a programming interface employing interprocess communication within the L4Re system. In doing so, I had defined calls or operations that would read from and write to a file, observing that some kind of “memory-mapped” file support might also be possible. At the time, I had no clear idea of how this would actually be made to work, however. As can often be the case, once some kind of intellectual challenge emerges, it can become almost impossible to resist the urge to consider it and to formulate some kind of solution. Consequently, I started digging deeper into a number of things: dataspaces, pagers, page faults, and the communication that happens within L4Re via the kernel to support all of these things. Because the L4Re developers have put a lot of effort into making a system where one can compile a fairly portable program and probably expect it to work, matters like the allocation of memory within programs, the use of functions like malloc, and other things we take for granted need no special consideration in the context of describing general development for an L4Re-based system. In principle, if our program wants more memory for its own use, then the use of things like malloc will probably suffice. It is where we have other requirements that some of the L4Re abstractions become interesting. In my previous efforts to support MIPS-based systems, these other requirements have included the need to access memory with a fixed and known location so that the hardware can be told about it, thus supporting things like framebuffers that retain stored data for presentation on a display device. But perhaps most commonly in a system like L4Re, it is the need to share memory between processes or tasks that causes us to look beyond traditional memory allocation techniques at what L4Re has to offer. Indeed, the filesystem work so far employs what are known as dataspaces to allow filesystem servers and client applications to exchange larger quantities of information conveniently via shared buffers. First, the client requests a dataspace representing a region of memory. It then associates it with an address so that it may access the memory. Then, the client shares this with the server by sending it a reference to the dataspace (known as a capability) in a message. The kernel, in propagating the message and the capability, makes the dataspace available to the server so that both the client and the server may access the memory associated with the dataspace and that these accesses will just work without any further effort. At this level of sophistication we can get away with thinking of dataspaces as being blocks of memory that can be plugged into tasks. Upon obtaining access to such a block, reads and writes (or loads and stores) to addresses in the block will ultimately touch real memory locations. Even in this simple scheme, there will be some address translation going on because each task has its own way of arranging its view of memory: its virtual address space. The virtual memory addresses used by a task may very well be different from the physical memory addresses indicating the actual memory locations involved in accesses. Such address translation is at the heart of operating systems like those supported by the L4 family of microkernels. But the system will make sure that when a task tries to access a virtual address available to it, the access will be translated to a physical address and supported by some memory location. With some knowledge of the underlying hardware architecture, we can say that each task will need support from the kernel and the hardware to be able to treat its virtual address space as a way of accessing real memory locations. In my experiments with simple payloads to run on MIPS-based hardware, it was sufficient to define very simple tables that recorded correspondences between virtual and physical addresses. Processes or tasks would access memory addresses, and where the need arose to look up such a virtual address, the table would be consulted and the hardware configured to map the virtual address to a physical address. Naturally, proper operating systems go much further than this, and systems built on L4 technologies go as far as to expose the mechanisms for normal programs to interact with. Instead of all decisions about how memory is mapped for each task being taken in the kernel, with the kernel being equipped with all the necessary policy and information, such decisions are delegated to entities known as pagers. When a task needs an address translated, the kernel pushes the translation activity over to the designated pager for a decision to be made. And the event that demands an address translation is known as a page fault since it occurs when a task accesses a memory page that is not yet supported by a mapping to physical memory. Pagers are therefore present to receive page fault notifications and to respond in a way that causes the kernel to perform the necessary privileged actions to configure the hardware, this being one of the few responsibilities of the kernel. Treating a dataspace as an abstraction for memory accessed by a task or application, the designated pager for the dataspace acts as a dataspace manager, ensuring that memory accesses within the dataspace can be satisfied. 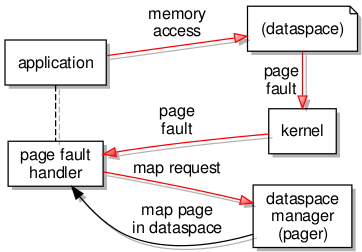 If an access causes a page fault, the pager must act to provide a mapping for the accessed page, leaving the application mostly oblivious to the work going on to present the dataspace and its memory as a continuously present resource. It is rather interesting to consider the act of delegation in the context of processor architecture. It would seem to be fairly common that the memory management units provided by various architectures feature built-in support for consulting various forms of data structures describing the virtual memory layout of a process or task. So, when a memory access fails, the information about the actual memory address involved can be retrieved from such a predefined structure. However, the MIPS architecture largely delegates such matters to software: a processor exception is raised when a “bad” virtual address is used, and the job of doing something about it falls immediately to a software routine. So, there seems to be some kind of parallel between processor architecture and operating system architecture, L4 taking a MIPS-like approach of eager delegation to a software component for increased flexibility and functionality. To get to the level of actual implementation, some familiarisation with other concepts is needed. Previously, my efforts have exposed me to the interprocess communications (IPC) central in L4Re as a microkernel-based system. I had even managed to gain some level of understanding around sending references or capabilities between processes or tasks. And it was apparent that this mechanism would be used to support paging. Unfortunately, the main L4Re documentation does not seem to emphasise the actual message details or protocols involved in these fundamental activities. Instead, the library code is described in reference documentation with some additional explanation. However, some investigation of the code yielded some insights as to the kind of interfaces the existing dataspace implementations must support, and I also tracked down some message sending activities in various components. When a page fault occurs, the first thing to know about it is the kernel because the fault occurs at the fundamental level of instruction execution, and it is the kernel’s job to deal with such low-level events in the first instance. Notification of the fault is then sent out of the kernel to the page fault handler for the affected task. The page fault handler then contacts the task’s pager to request a resolution to the problem. Here, the offset is the position of the failing memory access relative to the start of the dataspace; the flags describe the nature of the memory to be accessed. The “hot spot” and “flexpage” need slightly more explanation, the latter being an established term in L4 circles, the former being almost arbitrarily chosen and not particularly descriptive. When a page fault occurs, the handler identifies a region of memory where the failing access is occurring. Although it could merely request that memory be made available for a single page (of the smallest size) in which the access is situated, there is the possibility that a larger amount of memory be made available that encompasses this access page. The flexpage involved in a map request represents such a region of memory, having a size not necessarily decided in advance, being made available to the affected task. This brings us to the significance of the “hot spot” and some investigation into how the page fault handler and pager interact. I must admit that I find various educational materials to be a bit vague on this matter, at least with regard to explicitly describing the appropriate behaviour. Here, the flexpage paper was helpful in providing slightly different explanations, albeit employing the term “fraction” instead of “hot spot”. Here, the “hot spot” would reference page #3, and this information would be received by the pager. The significance of the “hot spot” appears to be the location of the failing access within a flexpage, and if the pager could provide it then a flexpage of four system pages would map precisely to the largest flexpage expected by the handler for the task. 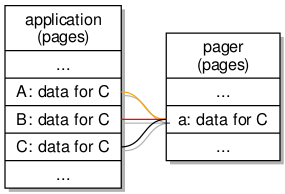 However, with only two system pages to spare, the pager can only send a flexpage consisting of those two pages, the “hot spot” being localised in page #1 of the flexpage to be sent, and the base of this flexpage being the base of page #0. Fortunately, the handler is smart enough to fit this smaller flexpage onto the “receive window” by using the original “hot spot” information, mapping page #2 in the receive window to page #0 of the received flexpage and thus mapping the access page #3 to page #1 of that flexpage. The largest flexpage that could be used to satisfy the failing access. The base of this flexpage. The page within this flexpage where the access occurs: the “hot spot”. The offset within the broader dataspace of the failing access, it indicating the data that would be expected in this page. How flexpages of different sizes may fit within the memory available to satisfy the request. The base of the most appropriate flexpage, where this might be the largest that fits within the available memory. The population of the available memory with data from the dataspace. To respond to the request, the pager sends a special flexpage item in its response message. Consequently, this flexpage is mapped into the task’s address space, and the execution of the task may resume with the missing data now available. If the dataspace being provided by a pager were merely a contiguous region of memory containing the data, there would probably be little else to say on the matter, but in the above I hint at some other applications. In my example, the pager only uses a certain amount of memory with which it responds to map requests. Evidently, in providing a dataspace representing a larger region, the data would have to be brought in from elsewhere, which raises some other issues. Firstly, if data is to be copied into the limited region of memory available for satisfying map requests, then the appropriate portion of the data needs to be selected. This is mostly a matter of identifying how the available memory pages correspond to the data, then copying the data into the pages so that the accessed location ultimately provides the expected data. It may also be the case that the amount of data available does not fill the available memory pages; this should cause the rest of those pages to be filled with zeros so that data cannot leak between map requests. Secondly, if the available memory pages are to be used to satisfy the current map request, then what happens when we re-use them in each new map request? It turns out that the mappings made for previous requests remain active! So if a task traverses a sequence of pages, and if each successive page encountered in that traversal causes a page fault, then it will seem that new data is being made available in each of those pages. But if that task inspects the earlier pages, it will find that the newest data is exposed through those pages, too, banishing the data that we might have expected. Of course, what is happening is that all of the mapped pages in the task’s dataspace now refer to the same collection of pages in the pager, these being dedicated to satisfying the latest map request. And so, they will all reflect the contents of those available memory pages as they currently are after this latest map request. One solution to this problem is to try and make the task forget the mappings for pages it has visited previously. I wondered if this could be done automatically, by sending a flexpage from the pager with a flag set to tell the kernel to invalidate prior mappings to the pager’s memory. After a time looking at the code, I ended up asking on the l4-hackers mailing list and getting a very helpful response that was exactly what I had been looking for! There is, in fact, a special way of telling the kernel to “unmap” memory used by other tasks (l4_task_unmap), and it is this operation that I ended up using to invalidate the mappings previously sent to the task. Thus the task, upon backtracking to earlier pages, finds that the mappings from virtual addresses to the physical memory holding the latest data are absent once again, and page faults are needed to restore the data in those pages. The result is a form of multiplexing access to a resource via a limited region of memory. Given the context of my investigations, it goes almost without saying that the origin of data in such a dataspace could be a file in a filesystem, but it could equally be anything that exposes data in some kind of backing store. And with this backing store not necessarily being an area of random access memory (RAM), we enter the realm of a more restrictive definition of paging where processes running in a system can themselves be partially resident in RAM and partially resident in some other kind of storage, with the latter portions being converted to the former by being fetched from wherever they reside, depending on the demands made on the system at any given point in time. One observation worth making is that a dataspace does not need to be a dedicated component in the system in that it is not a separate and special kind of entity. Anything that is able to respond to the messages understood by dataspaces – the paging “protocol” – can provide dataspaces. A filesystem object can therefore act as a dataspace, exposing itself in a region of memory and responding to map requests that involve populating that region from the filesystem storage. One can envisage more exotic forms of dataspace. Consider an image whose pixels need to be computed, like a ray-traced image, for instance. If it exposed those pixels as a dataspace, then a task reading from pages associated with that dataspace might cause computations to be initiated for an area of the image, with the task being suspended until those computations are performed and then being resumed with the pixel data ready to read, with all of this happening largely transparently. I started this exercise out of somewhat idle curiosity, but it now makes me wonder whether I might introduce memory-mapped access to filesystem objects and then re-implement operations like reading and writing using this particular mechanism. Not being familiar with how systems like GNU/Linux provide these operations, I can only speculate as to whether similar decisions have been taken elsewhere. But certainly, this exercise has been informative, even if certain aspects of it were frustrating. I hope that this account of my investigations proves useful to anyone else wondering about microkernel-based systems and L4Re in particular, especially if they too wish there were more discussion, reflection and collaboration on the design and implementation of software for these kinds of systems. Given the content covered by my previous articles, there probably doesn’t seem to be too much that needs saying about the topic covered by this article. Previously, I described the work involved in building libext2fs for L4Re and testing the library, and I described a framework for separating filesystem providers from programs that want to use files. But, as always, there are plenty of little details, detours and learning experiences that help to make the tale longer than it otherwise might have been. Although this file access framework sounds intimidating, it is always worth remembering that the only exotic thing about the software being written is that it needs to request system resources and to communicate with other programs. That can be tricky in itself in many programming environments, and I have certainly spent enough time trying to figure out how to use the types and functions provided by the many L4Re libraries so that these operations may actually work. But in the end, these are programs that are run just like any other. We aren’t building things into the kernel and having to conform to a particularly restricted environment. And although it can still be tiresome to have to debug things, particularly interprocess communication (IPC) problems, many familiar techniques for debugging and inspecting program behaviour remain available to us. The test program I had written for libext2fs simply opened a file located in the “rom” filesystem, exposed it to libext2fs, and performed operations to extract content. In my framework, I had directed my attention towards opening and reading files, so it made sense to concentrate on providing this functionality in a filesystem server or “provider”. 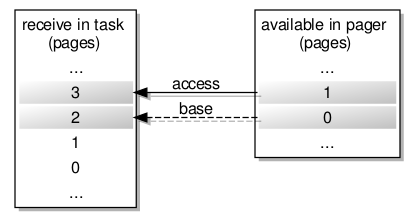 The user of the framework (shielded from the details by a client library) would request the opening of a file (thus obtaining a file descriptor able to communicate with a dedicated resource object) and then read from the file (causing communication with the resource object and some transfers of data). These operations, previously done in a single program employing libext2fs directly, would now require collaboration by two separate programs. These don’t appear next to each other in the actual code, but the first call is used to seek to the indicated position in the file, this having been specified by the client. The second call appears in a loop to read into a buffer an indicated amount of data, returning the amount that was actually read. After initialisation, the performance of each part of the work only occurs upon receiving a distinct kind of message from a client program, of which more details are given below. As noted above, the existing fwrite function in L4Re may be used to write file data out to the console. Ultimately, we would want our modified version of the function to be doing this job. These client library functions resemble lower-level C library functions such as open, read, write, close, and so on. 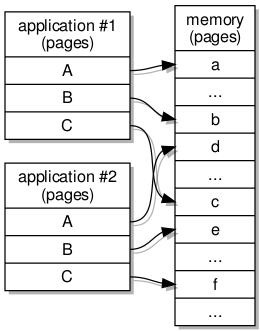 By targeting this particular level of functionality, it is hoped that much of the logic in functions like fopen can be preserved, this logic having to deal with things like mode strings (“r”, “r+”, “w”, and so on) which have little to do with the actual job of transmitting file content around the system. In order to do their work, the client library functions need to send and receive IPC messages, or at least need to get other functions to deal with this particular work. My approach has been to write a layer of functions that only deals with messaging and that hides the L4-specific details from the rest of the code. Here, the aim is to keep the interprocess interactions as simple and as infrequent as possible, with data buffered in the indicated buffer dataspace, and with reading and writing only occurring when the buffer is read or has been filled by writing. The more friendly semantics therefore need to be supported in the client library functions resting on top of these even-lower-level IPC messaging functions. The lack of a fs_close function might seem surprising, but as described in the previous article, the server process is designed to receive a notification when the client process discards a reference to the resource object dedicated to a particular file. So in client_close, we should be able to merely throw away the things acquired by client_open, and the system together with the server will hopefully handle the consequences. Using a conventional file as the repository for file content is convenient, but since the aim is to replace the existing filesystem mechanisms, it would seem necessary to try and get libext2fs to use other ways of accessing the underlying storage. Previously, my considerations had led me to provide a “block” storage layer underneath the filesystem layer. So it made sense to investigate how libext2fs might communicate with a “block server” or “block device” in order to read and write raw filesystem data. Changing the way libext2fs accesses its storage sounds like an ominous task, but fortunately some thought has evidently gone into accommodating different storage types and platforms. Indeed, the library code includes support for things like DOS and Windows, with this functionality evidently being used by various applications on those platforms (or, these days, the latter one, at least) to provide some kind of file browser support for ext2-family filesystems. The kind of component involved in providing this variety of support is known as an “I/O manager”, and the one that we have been using is known as the “Unix” I/O manager, this employing POSIX or standard C library calls to access files and devices. Now, this may have been adequate until now, but with the requirement that we use the replacement IPC mechanisms to access a block server, we need to consider how a different kind of I/O manager might be implemented to use the client library functions instead of the C library functions. It should be noted that the block server largely acts like a single-file filesystem, so the same interface supported by the filesystem server is also supported by the block server. This is how we get away with using the client libraries. By pushing use of the “rom” filesystem further down in the system, use of the new file access mechanisms can be introduced and tested, with the only “unauthentic” aspect of the arrangement being that a parallel set of file access functions is being used instead of the conventional ones. The only thing left to do would be to change the C library to incorporate the new style of file access, probably by incorporating the client library internally, thus switching the C library away from its previous method of accessing files. With the conventional file abstractions reimplemented, access to files would go via the virtual filesystem and hopefully end up encountering block devices that are able to serve up the needed data directly. And ultimately, we could end up switching back to using the Unix I/O manager with libext2fs. Changing things so drastically would also force us to think about maintaining access to the “rom” filesystem through the revised architecture, at least at first, because it happens to provide a very convenient way of getting access to data for use as storage. We could try and implement storage hardware support in order to get round this problem, but that probably isn’t convenient – or would be a distraction – when running L4Re on Fiasco.OC-UX as a kind of hosted version of the software. Indeed, tackling the C library is probably too much of a challenge at this early stage. Fortunately, there are plenty of other issues to be considered first, with the use of non-standard file access functions being only a minor inconvenience in the broader scheme of things. For instance, how are permissions and user identities to be managed? What about concurrent access to the filesystem? And what mechanisms would need to be provided for grafting filesystems onto a larger virtual filesystem hierarchy? I hope to try and discuss some of these things in future articles. I spent some time recently looking at my Python-like language, Lichen, and its toolchain. Although my focus was on improving support for floating point numbers and arithmetic, of which more may need to be written in a future article, I ended up noticing a few things that needed correcting and had escaped my attention. One of these probably goes a long way to solving a mystery raised in a previous article. The investigation into floating point support necessitated some scrutiny of the way floating point numbers are allocated when compiled Lichen programs are run. CPython – the C language implementation of a virtual machine for the Python language – has various strategies for reserving memory for floating point numbers, this not being particularly surprising given what it does for integers, as we previously saw. What bothered me was how much time was being spent allocating space for numbers needed to store computation results. Naturally, I will excuse you for not necessarily noticing the crucial difference, but it is the size of the attrs array, this defining the attributes that are available via each instance of the tuple type. And here, I had used a constant prefixed with “__csize” meaning class size, as opposed to “__isize” meaning instance size. With so many things to think about when finishing off my toolchain, I had accidentally presented the wrong kind of value to the code generating these type definitions. So, what was going to happen was that instances were going to be given the wrong number of attributes: a potentially catastrophic fault! But it is in the case of types like the tuple where things get more interesting than that. Such types tend to have lots of methods associated with them, and these methods are, of course, stored as class attributes. Evidently, something was very wrong until I noticed my simple mistake: that in the code generating the definitions for program types, I had accidentally used the wrong constant for instance attribute arrays. Fixing this meant that the memory allocator probably only needed to find 16 bytes or so, as opposed to maybe 186 bytes, for each number! Returning to tuples, though, it becomes interesting to see what effect this fix has on the performance of the benchmark previously discussed. We had previously seen that a program using tuples was inexplicably far slower than one employing objects to represent the same data. But with this unnecessary allocation occurring, it seems possible that this might have been making some extra work for the allocator and garbage collector. Although there is still a benefit to using objects to model data in Lichen as opposed to keeping such data in tuples, the benefit is not as pronounced as before, with the memory usage now clearly comparable as we would expect. With this fix applied, both versions of the benchmark are even faster than they were before, but it is especially gratifying that the object-based version is now ten times faster when compiled with the Lichen toolchain than the same program run by the CPython virtual machine. In my previous posts, I discussed the possibility of using “real world” filesystems in L4Re, initially considering the nature of code to access an ext2-based filesystem using the library known as libext2fs, then getting some of that code working within L4Re itself. Having previously investigated the nature of abstractions for providing filesystems and file objects to applications, it was inevitable that I would now want to incorporate libext2fs into those abstractions and to try and access files residing in an ext2 filesystem using those abstractions. It should be remembered that L4Re already provides a framework for filesystem access, known as Vfs or “virtual file system”. This appears to be the way the standard file access functions are supported, with the “rom” part of the filesystem hierarchy being supported by a “namespace filesystem” library that understands the way that the deployed payload modules are made available as files. To support other kinds of filesystem, other libraries must apparently be registered and made available to programs. Although I am sure that the developers of the existing Vfs framework are highly competent, I found the mechanisms difficult to follow and quite unlike what I expected, which was to see a clear separation between programs accessing files and other programs providing those files. Indeed, this is what one sees when looking at other systems such as Minix 3 and its virtual filesystem. I must also admit that I became tired of having to dig into the code to understand the abstractions in order to supplement the reference documentation for the Vfs framework in L4Re. One characteristic that I did want to uphold in any solution was to make programs largely oblivious to the nature of the accessed filesystems. They would navigate a virtual filesystem hierarchy, just as one does in Unix-like systems, with certain directories acting as gateways to devices exposing potentially different filesystems with superficially similar semantics. In a system like L4Re, with notions of clients and servers already prevalent, it seems natural to support a mechanism for requesting access to files that sees a client – a program wanting to access a file – delegating the task of locating that file to a server. How the server performs this task may be as simple or as complicated as we wish, depending on what kind of architecture we choose to support. In an operating system with a “monolithic” kernel, like GNU/Linux, we also see such delegation occurring, with the kernel being the entity having to support the necessary wiring up of filesystems contributing to the virtual filesystem. So, it makes sense to support an “open” system call just like in other operating systems. The difference here, however, is that since L4Re is a microkernel-based environment, both the caller and the target of the call are mere programs, with the kernel only getting involved to route the call or message between the programs concerned. We would first need to make sure that the program accessing files has a reference (known as a “capability”) to another program that provides a filesystem and can respond to this “open” message. This wiring up of programs is a task for the system’s configuration file, as featured in some of my previous articles. We may now consider what the filesystem-providing program or filesystem “server” needs to do when receiving an “open” message. Let us consider the failure to find the requested file: the filesystem server would, in such an event, probably just return a response indicating failure without any real need to do anything else. It is in the case of a successful lookup that the response to the caller or client needs some more consideration: the server could indicate success, but what is the client going to do with such information? And how should the server then facilitate further access to the file itself? It becomes gradually clearer that the filesystem server will need to allocate some resources for the client to conduct its activities, to hold information read from the filesystem itself and to hold data sent for writing back to the opened file. The server could manage this within a single abstraction and support a range of different operations, accommodating not only requests to open files but also operations on the opened files themselves. However, this might make the abstraction complicated and also raise issues around things like concurrency. 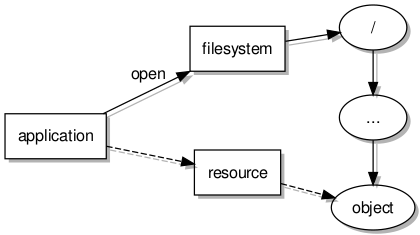 When a filesystem server receives an “open” message and locates a file, it allocates a separate object to act as a contact point for subsequent access to that file. This leaves the filesystem object free to service other requests, with these separate resource objects dealing with the needs of the programs wanting to read from and write to each individual file. The instantiation of an object in the filesystem server program holding the details of the accessed file. The creation of a new thread of execution in which the object will run. This permits it to handle incoming messages concurrently with the filesystem object. The creation of an “IPC gate” for the thread. This effectively exposes the object to the wider environment as what often appears to be known as a “kernel object” (rather confusingly, but it simply means that the kernel is aware of it and has to do some housekeeping for it). Once activated, the thread created for the resource is dedicated to listening for incoming messages and handling them, invoking methods on the resource object as a proxy for the client sending those messages to achieve the same effect. Although we have looked at how files manifest themselves and may be referenced, the matter of obtaining their contents has not been examined too closely so far. A program might be able to obtain a reference to a resource object and to send it messages and receive responses, but this is not likely to be sufficient for transferring content to and from the file. The reason for this is that the messages sent between programs – or processes, since this is how we usually call programs that are running – are deliberately limited in size. Thus, another way of exchanging this data is needed. In a situation where we are reading from a file, what we would most likely want to see is a read operation populate some memory for us in our process. Indeed, in a system like GNU/Linux, I imagine that the Linux kernel shuttles the file data from the filesystem module responsible to an area of memory that it has reserved and exposed to the process. In a microkernel-based system, things have to be done more “collaboratively”. The answer, it would seem to me, is to have dedicated memory that is shared between processes. Fortunately, and arguably unsurprisingly, L4Re provides an abstraction known as a “dataspace” that provides the foundation for such sharing. My approach, then, involves requesting a dataspace to act as a conduit for data, making the dataspace available to the file-accessing client and the file-providing server object, and then having a protocol to notify each other about data being sent in each direction. I considered whether it would be most appropriate for the client to request the memory or whether the server should do so, eventually concluding that the client could decide how much space it would want as a buffer, handing this over to the server to use to whatever extent it could. 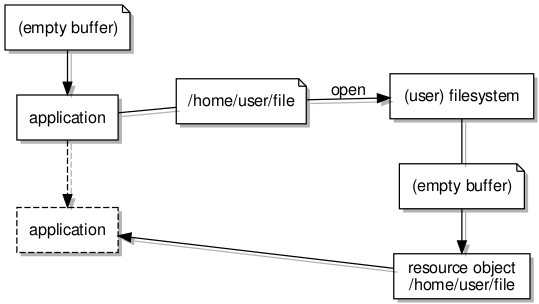 A benefit of doing things this way is that the client may communicate initialisation details when it contacts the server, and so it becomes possible to transfer a filesystem path – the location of a file from the root of the filesystem hierarchy – without it being limited to the size of an interprocess message. So, the “open” message references the newly-created dataspace, and the filesystem server reads the path written to the dataspace’s memory so that it may use it to locate the requested file. The dataspace is not retained by the filesystem object but is instead passed to the resource object which will then share the memory with the application or client. As described above, a reference to the resource object is returned in the response to the “open” message. Here, upon the application or client invoking the “read” operation (in other words, sending the “read” message) on the resource object, the resource is able to take control of the buffer, obtaining data from the file and writing it to the buffer memory. When it is done, its reply or response needs to indicate the updated state of the buffer so that the client will know how much data there is available, potentially amongst other things of interest. Many of us will be familiar with the workflow of opening, reading and writing, and closing files. This final activity is essential not only for our own programs but also for the system, so that it does not tie up resources for activities that are no longer taking place. In the filesystem server, for the resource object, a “close” operation can be provided that causes the allocated memory to be freed and the resource object to be discarded. However, merely providing a “close” operation does not guarantee that a program would use it, and we would not want a situation where a program exits or crashes without having invoked this operation, leaving the server holding resources that it cannot safely discard. We therefore need a way of cleaning up after a program regardless of whether it sees the need to do so itself. In my earliest experiments with L4Re on the MIPS Creator CI20, I had previously encountered the use of interrupt request (IRQ) objects, in that case signalling hardware-initiated events such as the pressing of physical switches. But I also knew that the IRQ abstraction is employed more widely in L4Re to allow programs to participate in activities that would normally be the responsibility of the kernel in a monolithic architecture. It made me wonder whether there might be interrupts communicating the termination of a process that could then be used to clean up afterwards. One area of interest is that concerning the “IPC gate” mentioned above. This provides the channel through which messages are delivered to a particular running program, and up to this point, we have considered how a resource object has its own IPC gate for the delivery of messages intended for it. But it also turns out that we can also enable notifications with regard to the status of the IPC gate via the same mechanism. By creating an IRQ object and associating it with a thread as the “deletion IRQ”, when the kernel decides that the IPC gate is no longer needed, this IRQ will be delivered. And the kernel will make this decision when nothing in the system needs to use the IPC gate any more. Since the IPC gate was only created to service messages from a single client, it is precisely when that client terminates that the kernel will realise that the IPC gate has no other users. The IPC gate is created for the resource thread, and its details are passed to the client, exposing the resource object. An IRQ object is bound to the thread and associated with the IPC gate deletion event. The server decreases its reference count, relinquishing the IPC gate and allowing its eventual destruction. The client and server communicate as desired. Upon the client terminating, the kernel disassociates the client from the IPC gate, decreasing the reference count. The kernel notices that the reference count is zero and sends an IRQ telling the server about the impending IPC gate deletion. The resource thread in the server deallocates the resource object and terminates. The IPC gate is deleted. Using the “gate label”, the thread handling communications for the resource object is able to distinguish between the interrupt condition and normal messages from the client. Consequently, it is able to invoke the appropriate cleaning up routine, to discard the resource object, and to terminate the thread. Hopefully, with this approach, resource objects will no longer be hanging around long after their clients have disappeared. Another approach to providing file content did also occur to me, and I wondered whether this might have been a component of the “namespace filesystem” in L4Re. One technique for accessing files involves mapping the entire file into memory using a “mmap” function. This could be supported by requesting a dataspace of a suitable size, but only choosing to populate a region of it initially. The file-accessing program would attempt to access the memory associated with the file, and upon straying outside the populated region, some kind of “fault” would occur. A filesystem server would have the job of handling this fault, fetching more data, allocating more memory pages, mapping them into the file’s memory area, and disposing of unwanted pages, potentially writing modified pages to the appropriate parts of the file. In effect, the filesystem server would act as a pager, as far as I can tell, and I believe it to be the case that Moe – the root task – acts in such a way to provide the “rom” files from the deployed payload modules. Currently, I don’t find it particularly obvious from the documentation how I might implement a pager, and I imagine that if I choose to support such things, I will end up having to trawl the code for hints on how it might be done. To present a relatively convenient interface to programs wanting to use files, some client library functions need to be provided. The intention with these is to support the traditional C library paradigms and for these functions to behave like those that C programmers are generally familiar with. This means performing interprocess communications using the “open”, “read”, “write”, “close” and other messages when necessary, hiding the act of sending such messages from the library user. The details of such a client library are probably best left to another article. With some kind of mechanism in place for accessing files, it becomes a matter of experimentation to see what the demands of the different operations are, and how they may be tuned to reduce the need for interactions with server objects, hopefully allowing file-accessing programs to operate efficiently. The next article on this topic is likely to consider the integration of libext2fs with this effort, along with the library functionality required to exercise and test it. And it will hopefully be able to report some real experiences of accessing ext2-resident files in relatively understandable programs. Figuring out the code that would be needed, this hopefully being supportable within L4Re. Introducing the software as a package within L4Re. Discovering the configuration required to build the code for L4Re. Actually generating a library file. Testing the library with a program. This process is not properly completed in that I do not yet have a good way of integrating with the L4Re configuration and using its details to configure the libext2fs code. I felt somewhat lazy with regard to reconciling the use of autotools with the rather different approach taken to build L4Re, which is somewhat reminiscent of things like Buildroot and OpenWrt in certain respects. So, instead, I built the Debian package from source in my normal environment, grabbed the config.h file that was produced, and proceeded to use it with a vastly simplified Makefile arrangement, also in my normal environment, until I was comfortable with building the library. Indeed, this exercise of simplified building also let me consider which portions of the libext2fs distribution would really be needed for my purposes. I did not really fancy having to struggle to build files that would ultimately be superfluous. Still, as I noted, this work isn’t finished. However, it is useful to document what I have done so far so that I can subsequently describe other, more definitive, work. Structuring the files so that the build system may process them. Persuading the build system to install things in places for other packages to find. Formulating the appropriate definitions to build the source files (and thus producing the right compiler and linker invocations). Here are some notes about the results. To follow L4Re conventions, public header files have been moved into the include hierarchy. This breaks assumptions in the code, with header files being referenced without a prefix (like “ext2fs”, “et”, “e2p”, and so on) in some places, but being referenced with such a prefix in others. The original build system for the code gets away with this by using the “ext2fs” and other prefixes as the directory names containing the code for the different libraries. It then indicates the parent “lib” directory of these directories as the place to start looking for headers. But I thought it worthwhile to try and map out the header usage and distinguish between public and private headers. At the very least, it helps me to establish the relationships between the different components involved. And I may end up splitting the different components into their own packages, requiring some formalisation of their interactions. This appears to be used in dependency resolution, causing the package to be built if another package requires one of the named entities in its own Control file. The effect of this is to install the headers into a include/contrib/libext2fs directory in the build output. So, avoiding this and having the original naming seems to be the benefit of the “contrib” settings, as far as I can tell. The latter of these is used to identify the build products so that the appropriate compiler and linker options can be retrieved by the build system when this library is required by another. Here, PC is short for “package config” but the notion of “package” is different from that otherwise used in this article: it just refers to the specific library being built in this case. We saw these things in the Control file. By indicating these other libraries, the compiler and linker options to find and use these other libraries will be brought in when something else requires libext2fs. This should help to prevent build failures caused by missing headers or libraries, and it should also permit more concise declarations of requirements by allowing those declarations to omit libet and libe2p in this case. Meanwhile, the actual source files are listed using a SRC_C definition, and the PRIVATE_INCDIR definition lists the different paths to be used to search for header files within this package. Moving the header files around complicates this latter definition substantially. There are other complications with libext2fs, notably the building of a tool that generates a file to be used when building the library itself. I will try and return to this matter at some point and figure out a way of doing this within the build system. Such generation of binaries for use in build processes can be problematic, particularly if there is some kind of assumption that the build system is the same as the target system, but such assumptions are probably not being made here. I will admit that since certain header files are not provided by L4Re, a degree of editing of the config.h file was required. Things like HAVE_LINUX_FD_H, indicating the availability of Linux-specific headers, needed to be removed. An appropriate program for testing the library is really not much different from one used in a GNU/Linux environment. Indeed, I just took some code from my existing program that lists a directory inside a filesystem image. Since L4Re should provide enough of a POSIX-like environment to support such unambitious programs, practically no changes were needed and no special header files were included. The interesting part is right at the end: a program called ex_ext2fstest is run with two arguments: the name of a file containing a filesystem image, and the directory inside that image that we want the program to show us. Here, we will be using the built-in “rom” filesystem in L4Re to serve up the data that we will be decoding with libext2fs in the program. In effect, we use one filesystem to bootstrap access to another! ext2fste| drwxr-xr-x-       0     0        1024 .
ext2fste| drwxr-xr-x-       0     0        1024 .. It really isn’t much to look at, but this indicates that we have managed to access an ext2 filesystem within L4Re using a program that calls the libext2fs library functions. If nothing else, the possibility of porting a library to L4Re and using it has been demonstrated. But we want to do more than that, of course. The next step is to provide access to an ext2 filesystem via a general interface that hides the specific nature of the filesystem, one that separates the work into a different program from those wanting to access files. To do so involves integrating this effort into my existing filesystem framework, then attempting to re-use a generic file-accessing program to obtain its data from ext2-resident files. Such activities will probably form the basis of the next article on this topic. I previously noted that accessing filesystems would be a component in my work with microkernel-based systems, and towards the end of last year I began an exercise in developing a simple “toy” filesystem that could hold file-like entities. Combining this with some L4Re-based components that implement seemingly reasonable mechanisms for providing access to files, I was able to write simple test programs that open and access these files. Since L4Re provides a rudimentary “rom” filesystem that exposes the modules embedded in the payload, I could open this “toy” filesystem module as a file within L4Re using the normal file access functions. And with that, I could then use my own functions to access the files stored within. Some additional effort went into exposing file access via interprocess communication, which forms the basis of those mechanisms mentioned above, those mechanisms being needed if such filesystems are to be generally usable in the broader environment rather than by just a single program. The first step in any such work is surely to devise how a filesystem is to be represented. Then, code must be written to access the filesystem, firstly to write files and directories to it, and then to be able to perform the necessary task of reading that file and directory information back out. At some point, an actual filesystem image needs to be prepared, and here it helps a lot if a convenient tool can be developed to speed up testing and further development. I won’t dwell on the “toy” representation I used, mostly because it was merely chosen to let me explore the mechanisms and interfaces to be provided as L4Re components. The intention was always to switch to a “real world” filesystem and to use that instead. But in order to avoid being overwhelmed with learning about existing filesystems alongside learning about L4Re and developing file access mechanisms, I chose some very simple representations that I thought might resemble “real world” filesystems sufficiently enough to make the exercise realistic. Here, an ext2 filesystem is prepared in a normal system file, and then the operating system is asked to mount the filesystem and to expose it via a mountpoint, this being a directory in the general hierarchy of files and filesystems. But this last step requires special privileges and for the kernel to get involved, and yet all we are doing is accessing a file with the data inside it stored in a particular way. So why is there not a more straightforward, unprivileged way of writing data to that file in the required format? Indeed, other projects of mine have needed to initialise filesystems, and such mounting operations have been a necessary aspect of those, given the apparent shortage of other methods. It really seemed that filesystems and kernel mechanisms were bound to each other, requiring us to always get the kernel involved. But it turns out that there are other solutions. I am reminded of the mtools suite of programs for accessing floppy disks. Once upon a time, when I was in my first year of university studies, practically all of our class’s programming was performed on a collection of DECstations. Although networked, each of these also provided a floppy drive capable of supporting 2.88MB disks: an uncommon sight, for me at least, with the availability of media and compatibility concerns dictating the use of 720KB and 1.44MB disks instead. Presumably, within the Ultrix environment we were using, normal users were granted access to the floppy drive when logged in. With a disk inserted, mtools could then be used to access the disk as one big file, interpreting the contents and presenting the user with a view onto files and directories. Of course, mtools exposes a DOS-like interface to the disk, with DOS-like commands providing DOS-like output, and it does not attempt to integrate the contents of a disk within the general Unix filesystem hierarchy. Indeed, the mechanisms of integrating such foreign data into the general filesystem hierarchy are denied to mere programs, this being a motivation for pursuing alternative operating system architectures like GNU Hurd which support such integration. But the point here is that filesystems – in this example, DOS-based filesystems on floppy disks – can readily be interpreted with the appropriate tools and without “operator” privileges. Since filesystems are really just data structures encoded in storage, there should really be no magic involved in decoding and accessing them. After all, the code in the Linux kernel and in other operating system kernels has to do just that, and these things are just programs that happen to run under certain special conditions. So it would make sense if some of the knowledge encoded in these kernels had been extracted and made available as library code for other purposes. After all, it might come in useful elsewhere. The e2fsprogs package itself depends on a package called libext2fs2 – or e2fslibs on earlier distribution versions – and ultimately one discovers that these tools and their libraries are provided by a software distribution, e2fsprogs, whose aim is to provide programs and libraries for general access to the ext2/3/4 filesystem format. So it turns out to be possible and indeed feasible to write programs accessing filesystems without needing to make use of code residing in some kernel or other. Amongst those listed is e2tools which offers a suite of commands resembling those provided by mtools, albeit with a Unix flavour instead of a DOS flavour. Investigating this, I discovered that these tools inherit somewhat from the utilities provided by e2fsprogs, particularly the debugfs utility. However, investigating e2fsprogs by myself gave me a chance to become familiar with the details of libext2fs and how the different utilities managed to use it. Since it is not always obvious to me how the library should be used, and I find myself missing some good documentation for it, the more program code I can find to demonstrate its use, the better. Currently, this can be made to populate a filesystem for eventual deployment, although the breadth of support for the filesystem features is rather limited. It is possible that I might adopt e2tools as the basis of this archiving program, given that it is merely a shell script that calls another program. Then again, it might be useful to gain direct experience with libext2fs for my other activities. And so, in the GNU/Linux environment, the creation of such archives has been the focus of my experiments. Meanwhile, I need to develop library functions to support filesystem operations within L4Re, which means writing code to support things like file descriptor abstractions and the appropriate functions for accessing and manipulating files and directories. The basics of some of this is already done for the “toy” filesystem, but it will be a matter of figuring out which libext2fs functions and abstractions need to be used to achieve the same thing for ext2 and its derivatives. Hopefully, once I can demonstrate file access via the same interprocess communications mechanisms, I can then make a start in replacing the existing conventional file access functions with versions that use my mechanisms instead of those provided in L4Re. This will most likely involve work on the C library support in L4Re, which is a daunting prospect, but some familiarity with that is probably beneficial if a more ambitious project to replace the C library is to be undertaken. But if I can just manage to get the dynamic linker to be able to read shared libraries from an ext2 filesystem, then a rather satisfying milestone will have been reached. And this will then motivate work to support storage devices on various hardware platforms of interest, permitting the hosting of filesystems and giving those systems some potential as L4Re-based general-purpose computing devices, too. Maybe some people like to see others attempting unusual challenges, things that wouldn’t normally be seen as productive, sensible or a good way to spend time and energy, things that shouldn’t be possible or viable but were nevertheless made to work somehow. And maybe they like the idea of indulging their own curiosity in such things, knowing that for potential future experiments of their own there is a route already mapped out to some kind of success. 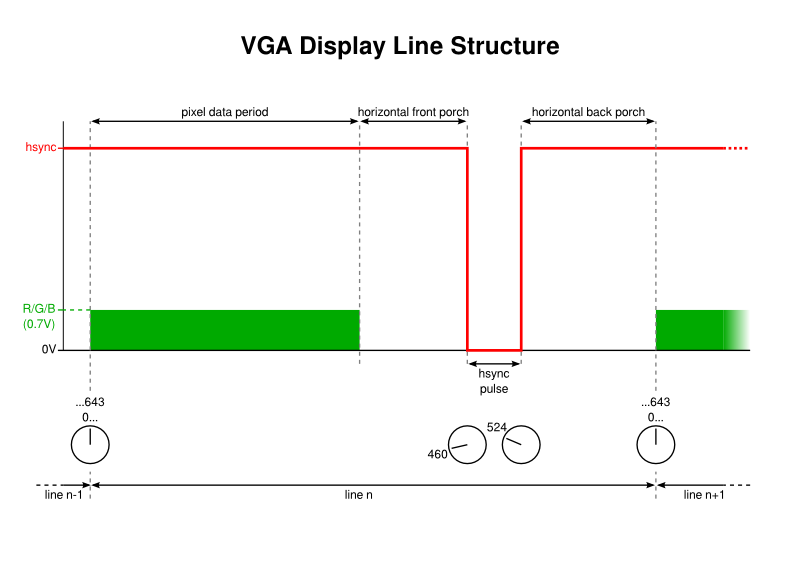 That might explain why my project to produce a VGA-compatible analogue video signal from a PIC32 microcontroller seems to attract more feedback than some of my other, arguably more useful or deserving, projects. Nevertheless, I was recently contacted by different people inquiring about my earlier experiments. One was admittedly only interested in using Free Software tools to port his own software to the MIPS-based PIC32 products, and I tried to give some advice about navigating the documentation and to describe some of the issues I had encountered. Another was more concerned with the actual signal generation aspect of the earlier project and the usability of the end result. Previously, I had also had a conversation with someone looking to use such techniques for his project, and although he ended up choosing a different approach, the cumulative effect of my discussions with him and these more recent correspondents persuaded me to take another look at my earlier work and to see if I couldn’t answer some of the questions I had received more definitively. Although one of my correspondents was very complimentary about the form of my assembly language code, I rather felt that it was holding me back, making me focus on details that should be abstracted away. It should be said that MIPS assembly language is fairly pleasant to write, at least in comparison to certain other architectures. Anyway, I had previously introduced functionality in C in my earlier work, mostly because I didn’t want the challenge of writing graphics routines in assembly language. So with the need to more easily experiment with different peripheral configurations, I decided to migrate the remaining functionality to C, leaving only the lowest-level routines concerned with booting and exception/interrupt handling in assembly language. This effort took me to some frustrating places, making me deal with things like linker scripts and the kind of memory initialisation that one’s compiler usually does for you but which is absent when targeting a “bare metal” environment. I shall spare you those details in this article. I therefore spent a certain amount of effort in developing some C library functionality for dealing with the hardware. It could be said that I might have used existing libraries instead, but ignoring Microchip’s libraries that will either be proprietary or the subject of numerous complaints by those unwilling to leave that company’s “ecosystem”, I rather felt that the exercise in library design would be useful in getting reacquainted and providing me with something I would actually want to use. An important goal was minimalism, whereas my impression of libraries such as those provided by the Pinguino effort are that they try and bridge the different PIC hardware platforms and consequently accumulate features and details that do not really interest me. I have left the identification of all wide pixel columns to the reader! Nevertheless, it can be stated that these pixels occur in every fourth column and are especially noticeable with things like text, where at such low resolutions, the doubling of pixel widths becomes rather obvious and annoying. Quite why this increase in pixel width was occurring became a matter I wanted to investigate. As you may recall, the technique I used to output pixels involved getting the direct memory access (DMA) controller in the PIC32 chip to “copy” the contents of memory to a hardware register corresponding to output pins. The signals from these pins were sent along the cable to the monitor. And the DMA controller was transferring data as fast as it could and thus producing pixel colours as fast as it could. One of my correspondents looked into the matter and confirmed that we were not imagining this problem, even employing an oscilloscope to check what was happening with the signals from the output pins. 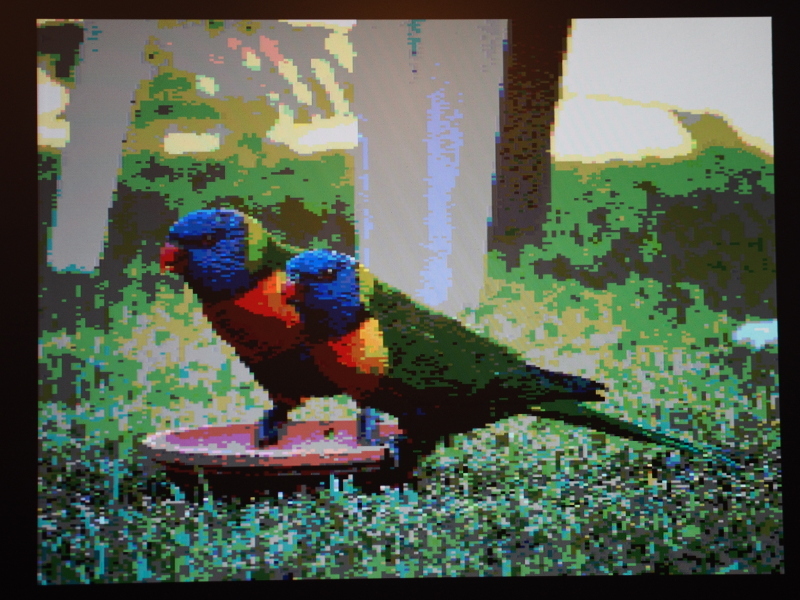 The DMA controller would, after starting each fourth pixel, somehow not be able to produce the next pixel in a timely fashion, leaving the current pixel colour unchanged as the monitor traced the picture across the screen. 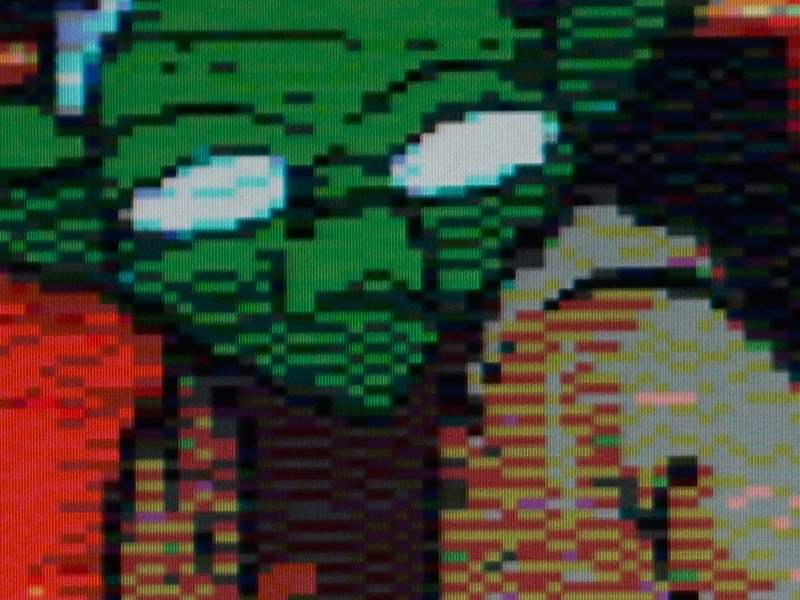 This would cause these pixels to “stretch” until the first pixel from the next group could be emitted. Initially, I had thought that interrupts were occurring and the CPU, in responding to interrupt conditions and needing to read instructions, was gaining priority over the DMA controller and forcing pixel transfers to wait. Although I had specified a “cell size” of 160 bytes, corresponding to 160 pixels, I was aware that the architecture of the system would be dividing data up into four-byte “words”, and it would be natural at certain points for accesses to memory to be broken up and scheduled in terms of such units. I had therefore wanted to accommodate both the CPU and DMA using an approach where the DMA would not try and transfer everything at once, but without the energy to get this to work, I had left the matter to rest. However, given the wide pixel effect, it becomes more interesting to introduce a steady rhythm by using smaller cell sizes and having an external event coordinate each cell’s transfer. With a single, large transfer, only one initiation event needs to occur: that produced by the timer whose period corresponds to that of a single horizontal “scanline”. 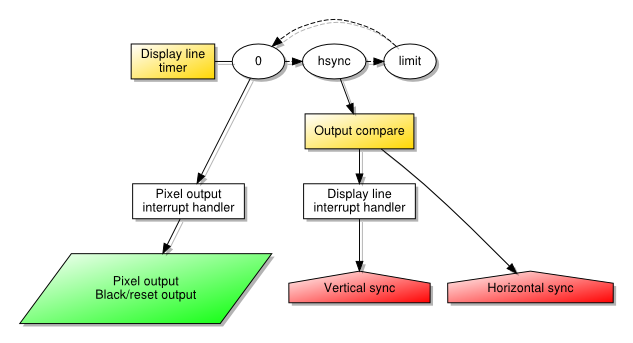 The DMA channel producing pixels then runs to completion and triggers another channel to turn off the pixel output. In this scheme, the initiating condition for the cell transfer is the timer. 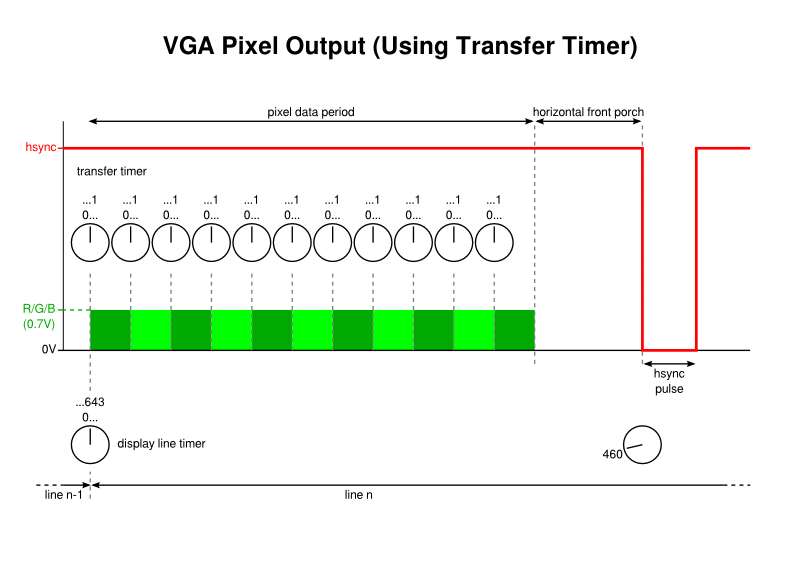 When using multiple cells to transfer the pixel data, however, it is no longer possible to use the timer in this way. Doing so would cause the initiation of the first cell, but then subsequent cells would only be transferred on subsequent timer events. And since these events only occur once per scanline, this would see a single line’s pixel data being transferred over many scanlines instead (or, since the DMA channel would be updated regularly, we would see only the first pixel on each line being emitted, stretched across the entire line). Since the DMA mechanism apparently does not permit one kind of interrupt condition to enable a channel and another to initiate each cell transfer, we must be slightly more creative. Fortunately, the solution is to chain two channels, just as we already do with the pixel-producing channel and the one that resets the output. A channel is dedicated to waiting for the line timer event, and it transfers a single black pixel to the screen before handing over to the pixel-producing channel. This channel, now enabled, has its cell transfers regulated by another interrupt condition and proceeds as fast as such a condition may occur. Finally, the reset channel takes over and turns off the output as before. The nature of the cell transfer interrupt can take various forms, but it is arguably most intuitive to use another timer for this purpose. We may set the limit of such a timer to 1, indicating that it may “wrap around” and thus produce an event almost continuously. And by configuring it to run as quickly as possible, at the frequency of the peripheral clock, it may drive cell transfers at a rate that is quick enough to hopefully produce enough pixels whilst also allowing other activities to occur between each transfer. One thing is worth mentioning here just to be explicit about the mechanisms involved. When configuring interrupts that are used for DMA transfers, it is the actual condition that matters, not the interrupt nor the delivery of the interrupt request to the CPU. So, when using timer events for transfers, it appears to be sufficient to merely configure the timer; it will produce the interrupt condition upon its counter “wrapping around” regardless of whether the interrupt itself is enabled. With a cell size of a single byte, and with a peripheral clock running at half the speed of the system clock, this approach is sufficient all by itself to yield pixels with consistent widths, with the only significant disadvantage being how few of them can be produced per line: I could only manage in the neighbourhood of 80 pixels! Making the peripheral clock run as fast as the system clock doesn’t help in theory: we actually want the CPU running faster than the transfer rate just to have a chance of doing other things. Nor does it help in practice: picture stability rather suffers. Using larger cell sizes, we encounter the wide pixel problem, meaning that the end of a four-byte group is encountered and the transfer hangs on for longer than it should. However, larger cell sizes also introduce byte transfers at a different rate from cell transfers (at the system clock rate) and therefore risk making the last pixel produced by a cell longer than the others, anyway. Even without any extra operations or interruptions, we would get a gap between the write operations that would cause a wider pixel. This would only get worse if the DMA controller had to update the address of the pixel data after every four-byte read and write, not being able to do so concurrently with those operations. And if the CPU were really able to interrupt longer transfers, even to obtain a single instruction to execute, it might then compete with the DMA controller in accessing memory, making the read operations even later every time. 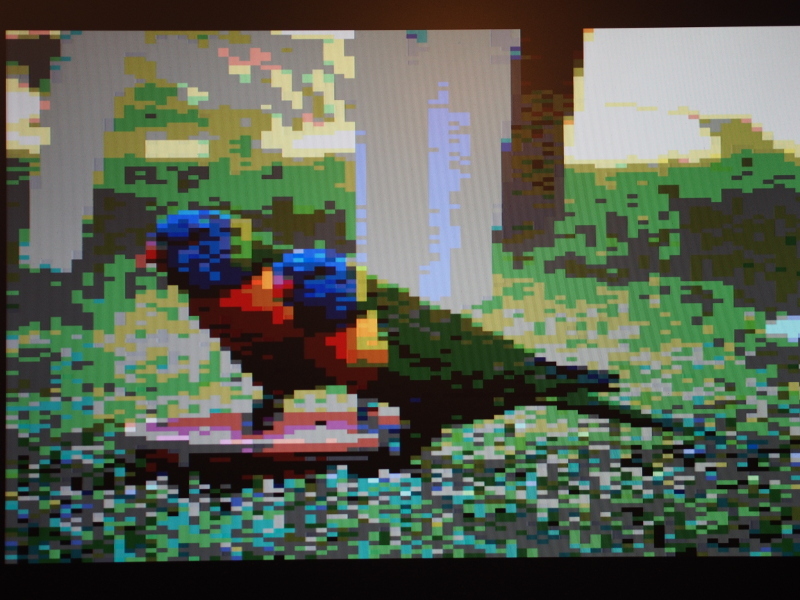 If only pixel data could be read from memory and written to the output register (and thus the display) concurrently, we might have a continuous stream of evenly-sized pixels. Such things do not seem possible with the microcontroller I happen to be using. Either concurrent reading from memory and writing to a peripheral is not possible or the DMA controller is not able to take advantage of this concurrency. But these observations did give me another idea. 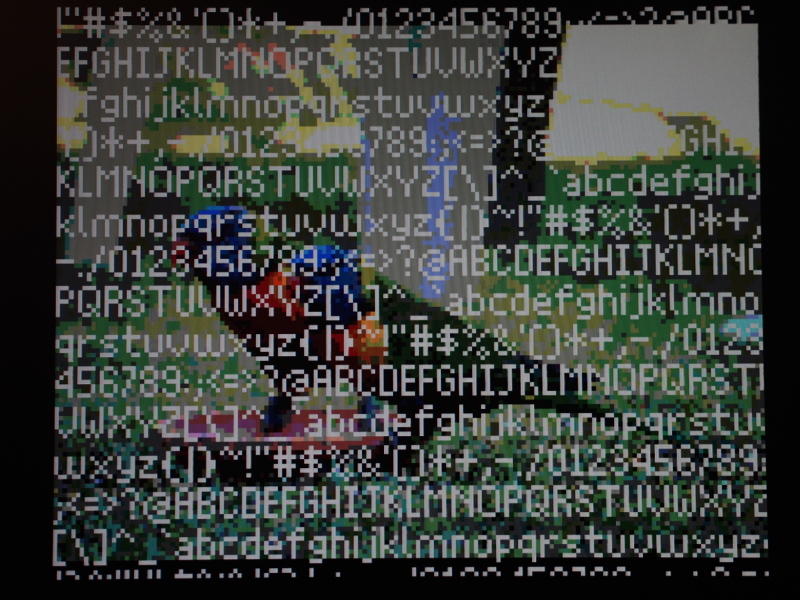 Channel #2: "n neaan el!\n"
Combined: "And once again, hello\r\n"
Here, the asterisks mark the start of each channel’s data, with each channel only needing to transfer half the usual amount. The documentation does, in fact, mention that where multiple channels are active with the same priority, each one is given control in turn with the controller cycling through them repeatedly. The matter of which order they are chosen, which is important for us, seems to be dependent on various factors, only some of which I can claim to understand. For instance, I suspect that if the second channel refers to data that appears before the first channel’s data in memory, it gets scheduled first when both channels are activated. Although this is not a significant concern when just trying to produce a stable picture, it does limit more advanced operations such as horizontal scrolling. As you can see, trying this technique out with timed transfers actually made a difference. Instead of only managing something approaching 80 pixels across the screen, more than 90 can be accommodated. Meanwhile, experiments with transfers going as fast as possible seemed to make no real difference, and the fourth pixel in each group was still wider than the others. Still, making the timed transfer mode more usable is a small victory worth having, I suppose. At the start of my interest in this project, I had it in my mind that I would couple DMA transfers with the parallel mode (or Parallel Master Port) functionality in order to generate a VGA signal. Certain aspects of this, particularly gaps between pixels, made me less than enthusiastic about the approach. However, in considering what might be done to the output signal in other situations, I had contemplated the use of a flip-flop to hold output stable according to a regular tempo, rather like what I managed to achieve, almost inadvertently, when introducing a transfer timer. Until recently, I had failed to apply this idea to where it made most sense: in regulating the parallel mode signal. Since parallel mode is really intended for driving memory devices and display controllers, various control signals are exposed via pins that can tell these external devices that data is available for their consumption. For our purposes, a flip-flop is just like a memory device: it retains the input values sampled by its input pins, and then exposes these values on its output pins when the inputs are “clocked” into memory using a “clock pulse” signal. The parallel mode peripheral in the microcontroller offers various different signals for such clock and selection pulse purposes. 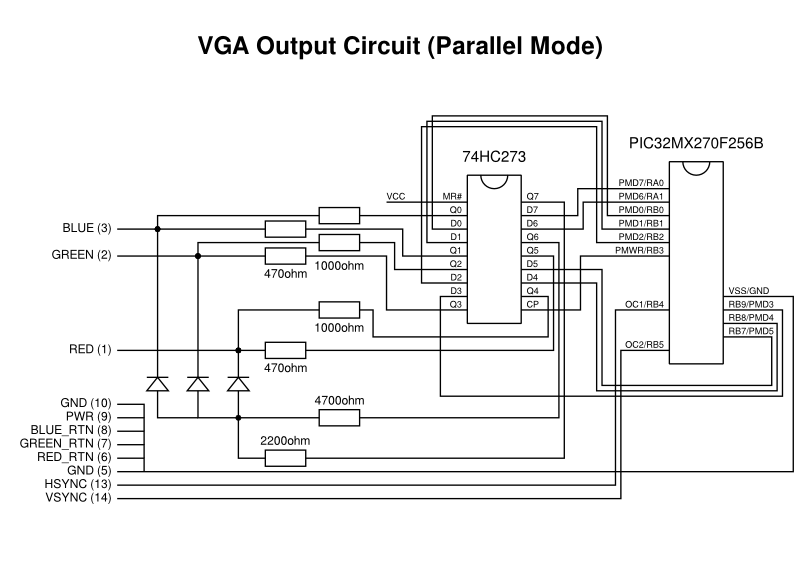 Employing the PMWR (parallel mode write) signal as the clock pulse, directing the display signals to the flip-flop’s inputs, and routing the flip-flop’s outputs to the VGA circuit solved the pixel gap problem at a stroke. Unfortunately, it merely reminded us that the wide pixel problem also affects parallel mode output, too. Although the clock pulse is able to tell an external component about the availability of a new pixel value, it is up to the external component to regulate the appearance of each pixel. A memory device does not care about the timing of incoming data as long as it knows when such data has arrived, and so such regulation is beyond the capabilities of a flip-flop. It was observed, however, that since each group of pixels is generated at a regular frequency, the PMWR signalling frequency might be reduced by being scaled by a constant factor. This might allow some pixel data to linger slightly longer in the flip-flop and be slightly stretched. By the time the fourth pixel in a group arrives, the time allocated to that pixel would be the same as those preceding it, thus producing consistently-sized pixels. I imagine that a factor of 8/9 might do the trick, but I haven’t considered what modification to the circuit might be needed or whether it would all be too complicated. When people normally experiment with video signals from microcontrollers, one tends to see people writing code to run as efficiently as is absolutely possible – using assembly language if necessary – to generate the video signal. It may only be those of us using microcontrollers with DMA peripherals who want to try and get the DMA hardware to do the heavy lifting. Indeed, those of us with exposure to display peripherals provided by system-on-a-chip solutions feel almost obliged to do things this way. But recent discussions with one of my correspondents made me reconsider whether an adequate solution might be achieved by just getting the CPU to do the work of transferring pixel data to the display. Previously, another correspondent had indicated that it this was potentially tricky, and that getting the timings right was more difficult than letting the hardware synchronise the different mechanisms – timer and DMA – all by itself. By involving the CPU and making it run code, the display line timer would need to generate an interrupt that would be handled, causing the CPU to start running a loop to copy data from the framebuffer to the output port. Here, the line data is copied byte by byte to the output port. Some adornments are necessary to persuade the compiler to generate code that writes the data efficiently and in order, but there is nothing particularly exotic required and GCC does a decent job of doing what we want. After the loop, a black/reset pixel is generated to set the appropriate output level. One concern that one might have about using the CPU for such long transfers in an interrupt handler is that it ties up the CPU, preventing it from doing other things, and it also prevents other interrupt requests from being serviced. In a system performing a limited range of activities, this can be acceptable: there may be little else going on apart from updating the display and running programs that access the display; even when other activities are incorporated, they may accommodate being relegated to a secondary status, or they may instead take priority over the display in a way that may produce picture distortion but only very occasionally. Many of these considerations applied to systems of an earlier era. Thinking back to computers like the Acorn Electron – a 6502-based system that formed the basis of my first sustained experiences with computing – it employs a display controller that demands access to the computer’s RAM for a certain amount of the time dedicated to each video frame. The CPU is often slowed down or even paused during periods of this display controller’s activity, making programs slower than they otherwise would be, and making some kinds of input and output slightly less reliable under certain circumstances. Nevertheless, with certain kinds of additional hardware, the possibility is present for such hardware to interrupt the CPU and to override the display controller that would then produce “snow” or noise on the screen as a consquence of this high-priority interruption. Such issues cause us to consider the role of the DMA controller in our modern experiment. We might well worry about loading the CPU with lots of work, preventing it from doing other things, but what if the DMA controller dominates the system in such a way that it effectively prevents the CPU from doing anything productive anyway? This would be rather similar to what happens with the Electron and its display controller. So, evaluating a CPU-driven solution seems to be worthwhile just to see whether it produces an acceptable picture and whether it causes unacceptable performance degradation. My recent correspondence also brought up the assertion that the RAM and flash memory provided by PIC32 microcontrollers can be accessed concurrently. This would actually mitigate contention between DMA and any programs running from flash memory, at least until the point that accesses to RAM needed to be performed by those programs, meaning that we might expect some loss of program performance by shifting the transfer burden to the CPU. Ultimately, having accepted that the compiler would produce good-enough code and that I didn’t need to try more exotic things with assembly language, I managed to produce a stable picture. Maybe I should have taken this obvious path from the very beginning. However, the presence of DMA support would have eventually caused me to investigate its viability for this application, anyway. And it should be said that the performance differences between the CPU-based approach and the DMA-based approaches might be significant enough to argue in favour of the use of DMA for some purposes. What started out as a quick review of my earlier work turned out to be a more thorough study of different techniques and approaches. I managed to get timed transfers functioning, revisited parallel mode and made it work in a fairly acceptable way, and I discovered some optimisations that help to make certain combinations of techniques more usable. But what ultimately matters is which approaches can actually be used to produce a picture on a screen while programs are being run at the same time. 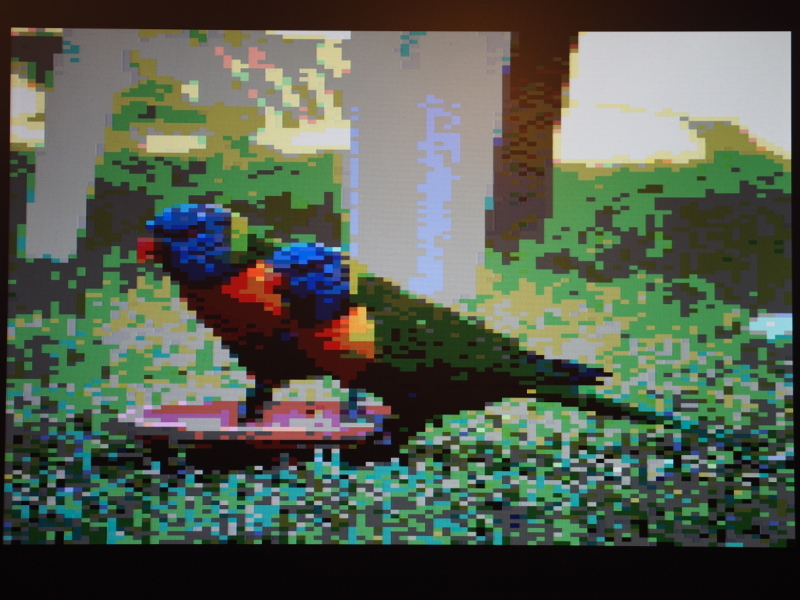 To give the CPU more to do, I decided to implement some graphical operations, mostly copying data to a framebuffer for its eventual transfer as pixels to the display. The idea was to engage the CPU in actual work whilst also exercising access to RAM. If significant contention between the CPU and DMA controller were to occur, the effects would presumably be visible on the screen, potentially making the chosen configuration unusable. Although some approaches seem promising on paper, and they may even produce promising results when the CPU is doing little more than looping and decrementing a register to introduce a delay, these approaches may produce less than promising results under load. The picture may start to ripple and stretch, and under “real world” load, the picture may seem noisy and like a badly-tuned television (for those who remember the old days of analogue broadcast signals). Two approaches seem to remain robust, however: the use of timed DMA transfers, and the use of the CPU to do all the transfer work. The former is limited in terms of resolution and introduces complexity around the construction of images in the framebuffer, at least if optimised as much as possible, but it seems to allow more work to occur alongside the update of the display, and the reduction in resolution also frees up RAM for other purposes for those applications that need it. Meanwhile, the latter provides the resolution we originally sought and offers a straightforward framebuffer arrangement, but it demands more effort from the CPU, slowing things down to the extent that animation practically demands double buffering and thus the allocation of even more RAM for display purposes. But both of these seemingly viable approaches produce consistent pixel widths, which is something of a happy outcome given all the effort to try and fix that particular problem. One can envisage accommodating them both within a system given that various fundamental system properties (how fast the system and peripheral clocks are running, for example) are shared between the two approaches. Again, this is reminiscent of microcomputers where a range of display modes allowed developers and users to choose the trade-off appropriate for them. Having investigated techniques like hardware scrolling and sprite plotting, it is tempting to keep developing software to demonstrate the techniques described in this article. I am even tempted to design a printed circuit board to tidy up my rather cumbersome breadboard arrangement. And perhaps the library code I have written can be used as the basis for other projects. It is remarkable that a home-made microcontroller-based solution can be versatile enough to demonstrate aspects of simple computer systems, possibly even making it relevant for those wishing to teach or to learn about such things, particularly since all the components can be connected together relatively easily, with only some magic happening in the microcontroller itself. And with such potential, maybe this seemingly pointless project might have some meaning and value after all! Although I can’t embed video files of any size here, I have made a “standard definition” video available to demonstrate scrolling and sprites. I hope it is entertaining and also somewhat illustrative of the kind of thing these techniques can achieve.